gambling everything on her new business, Confection Consultations. knowledge. They see past the exterior and fall for the chocolate delights in front of them. all about the chocolate now. 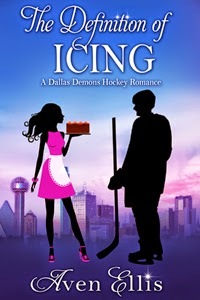 Because a chance meeting with new Dallas Demon hockey star Nate Johansson might change everything. happened to him in Minnesota. After ADORING Aven Ellis's Waiting For Prince Harry, I knew I would be in for another treat with the second Dallas Demons installment. Ellis kept telling me I would love Nate even more and holy moly she was right! I absolutely adored Nate, Kenley, and their romance. It was JUST what I needed after a pretty heavy reading slump. Nate Johansson is seriously my type of guy. Tatted, a bit rougher around the edges, but a total sweetheart who is loyal to his family and friends.... Sigh. I loved him. He has recently been traded to Dallas from Minnesota and while he has left everything behind, it was a fresh start that he desperately needed. Having been betrayed before, Nate isn't looking for a relationship, let alone love. He certainly doesn't expect Kenley Hunter to come into his life. Kenley herself is on a bit of a man sabbatical, especially after she was hurt by her last boyfriend. She wants what any girl wants: to be loved for who she is. She wants people to look past her looks and see the real her- an intelligent, driven woman who loves what she does. I loved Kenley- she was a sweetheart and finds herself in admiration of Nate, especially after he stands up for her at a photo shoot they were both attending. Nate makes it clear from the beginning that he isn't looking to date anyone right now, but the more time he spends with Kenley, the more he can't help but crave being with her. The two just click so well and I liked that about them. It's so much fun watching them skirt around the other in terms of their feelings. Both of them are falling for one another and yet both are too afraid to open up and tell the other how they truly feel. I love that this book is so low in angst. Sure, Kenley and Nate have a few bumps in the road to overcome, but overall it's just a sweet, romantic story and I couldn't get enough. I loved Kenley and Nate's chemistry and I felt my insides were turning to liquid at some of their romantic scenes together. We also get to see Harrison and Kylie again, which completely made my day. I liked seeing both couples become such good friends with one another. I also really enjoyed Lexi, Kenley's best friend, and her sister, Amanda. Both were such good friends to Kenley and I am always up for seeing strong female friendships. I also love how in each book she manages to uniquely incorporate some fun idea into the chapters. At the beginning of each chapter of this book, we get alternating definitions about Kenley's chocolate making and about hockey from Nate. They come together so well at the end and I loved seeing that! Ellis has informed me that Lexi's book will be next and I can't wait to see her fall in love, especially after Kenley teases her about it in this one. I can't wait to see which Dallas Demon player she will end up falling for... and if he can top Nate Johansson! I can't recommend this book enough if you're looking for a sweet, light hearted romance. Ellis always incorporates such fun dialogue into her writing and there were a few scenes where I couldn't stop laughing. This was a win for me and I can't wait for the next book to release! Definitely sounds like one for me! Especially the low on angst part, lately I have just not been in the mood for angst so I gotta add this one to my wishlist. Awesome review! Yes! It's so adorable! I loved it so very much! I really hope you read it T! OMG! How have I never heard of this series, Jess?! It sounds perfect for me. I love that this one is so low on the angst. And Nate sounds like a dreamboat. I'm already shipping this couple like crazy. I'll have to check it out for sure. NICK! READ THESE. Seriously. You will love them! The first book is awesome too! This sounds like the perfect summer read! Great review. Adding it to my TBR for sure! Yay! I'm so glad! I can't recommend it enough! SO happy you loved Nate! He's my fave so far! :) Plus all the chocolate talk just had me craving chocolate!! haha. YAY! He's mine too for sure! OMG- that chocolate talk was driving me to distraction! I was craving sweets. YOU DO! I think you'll like it! Super cute and fun.